Shaken or stirred—these stylish picks are all you need! Whether you built your bar cart yourself as an A+ DIY project (in wood perhaps?) or took your inspo from one of these swanky styles you can find in stores, the next step is to deck it out with all the at-home bar essentials. You'll need to prioritize certain things depending on how big your bar cart is, but having a shaker, jigger and set of glasses is the perfect place to start. From there you may want to add a variety of glasses for different drinks (coups and highballs and tumblers, oh my! ), as well as a pitcher, bottle opener and ice bucket. 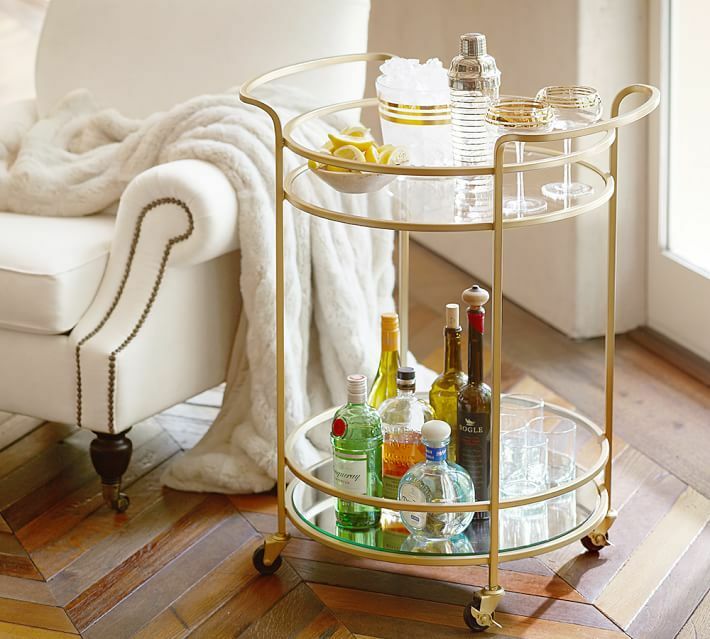 To get you started stocking your dream bar cart (we suggest this beauty from Pottery Barn), we rounded up some of the coolest and most cocktail-worthy accessories. From fancy-looking Ikea glasses for less than $2 each to a snazzy, investment-worthy shaker, you'll be ready to shake and stir drink with the best of 'em! 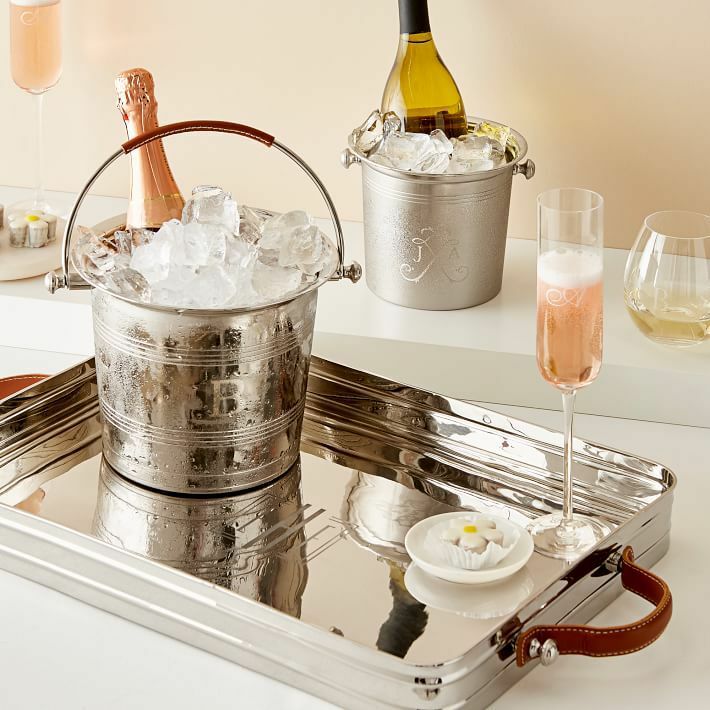 For impromptu champagne celebrations or at-home cocktail hours, having an ice bucket on hand makes for an instant classy touch. Rather than sending your guests to and from the kitchen you keep their drinks cool and refreshed on the spot. You can't make a proper mojito without a proper muddler, so be sure to add one of these essential wooden tools to your bar cart. Muddling helps extract and mix the flavors of cocktail ingredients like fresh herbs, fruits and simple syrups together—making for an expertly balanced drink. Get jigger with it! (Sorry, we couldn't help it.) When mixing cocktails with elaborate or specific ingredient lists, having a jigger is essential. The larger end is perfect for measuring out liquor, while the smaller is great for things like simple syrup and Triple Sec. We also happen to think this one from Kate Spade is especially cute. You might not know this, but Bloomingdale's is truly a treasure trove of stylish kitchen and tabletop wares. This brass cocktail shaker is no exception, and will add a glamorous feel to your bar cart. Perhaps one of the more superfluous tools for your bar cart, we still had to give a shout out to the cocktail spoon. Use for stirring drinks and not much else, we think they're worth the purchase if you love a well-crafted old fashioned or martini. Celebrations can happen any time, and we fully believe that having at least two champagne flutes (or coupes) at the ready is essential for any home bar. Plus—they will look gorgeous on your bar cart. These petite flutes from Anthropologie have delicate etching on the vessel and short stem, making them both unusual and rather practical. Oh you fancy, huh? If you like the occasional brandy or cognac, it helps to have the perfect glasses on-hand for imbibing. To get the perfect pour, simply hold the glass horizontally and fill until the liquid almost reaches the lip of the glass. Making your bar cart look great doesn't have to cost a fortune. If you're just starting out with home decor or accidentally blew your budget on the cart itself (we don't blame you!) swing by an IKEA and stock up on their extremely affordable glassware. These glasses are roughly the right size for a double old fashioned and cost less than $2 each! For days and nights when you're simply craving an ice cold beer, it helps to have a bottle opener at the ready. Now, is it absolutely necessary to splurge on a $125 opener? Of course not, but if you're feeling decadent or looking for a really stylish wedding or house warming gift, this elegant option fits the bill perfectly. Daiquiris, mojitos and all things served in a tall highball glass only get better when served with a straw. Instead of those paper straws that look nice but tend to disintegrate in your drink after a while, try these chic metal straws that are washable and reusable. Martini lovers, this one's for you! Set your olives and onions right where they belong with these retro-inspired cocktail picks in the shape of swords, available at Pottery Barn. They also work for skewering candied ginger in your Moscow Mule.